The sun rises over the mountains above us each morning and the crew begins again. Each with long-sleeved cotton shirts to withstand the heat of the day, a large straw hat, and a red handled Felco pruner at their side. At 6am the cool, crisp morning air greets eight men of brothers and sons who both work and live on our ranch. The hands of our crew show their story of hard work, their faces share their innocence, and their bright eyes exude their sense of loyalty and pride to our family and where they labor each day. A man walked on to our property in 1964 looking for work, and hoping for a place to live. His name was Fidel Gonzalez. He ventured up, what was once a dirt road to the Patron's house, Jim Miller, Justin's father. Early on, Justin's dad knew the importance of treating his laborers well and has always given each man housing as part of their employment on our property. The old prune hydration building was converted to the kitchen and we added on a few bedrooms. We continue to house the Gonzalez family on our property today. A few years ago, we decided it was time to purchase a second property with three homes to give them additional space and a home. Fidel brought much more than a determination to make a better life for his family in Mexico that day he walked up the driveway asking for work. He brought a foundation for a crew who would be a part of the commitment to consistent, and dedicated viticulture on our property. They would each learn the dynamics of fine wine growing and articulate care for these wise plants. Could you imagine working and living at the same place your entire life? The men who are the backbone of our livelihood were brought here by their father, Fidel Gonzalez. Fidel immigrated from Morelia, Mexico in the early 1960s with nothing more than a heart full of determination and hope to make a better life for his family. He left behind his wife Angela and his six children - five sons and a daughter. Dagroberto was his eldest son who was the first to step foot where his father had worked for many years before. Thirty-seven to be exact. Dago is now our lead tractor driver and one we count on for most everything. Now Dago, his lovely wife Carolina and his son's Jesus and Juan live on the property. Jesus is in his second year at University and the first grandson to attend college studying Mechanical Engineering. We are incredibly proud of him. Eventually Fidel brought up each of his son's including Jose, Esteban, Benjamin and Carlos. These men are brothers and a hard working crew who we are greatly indebted too. 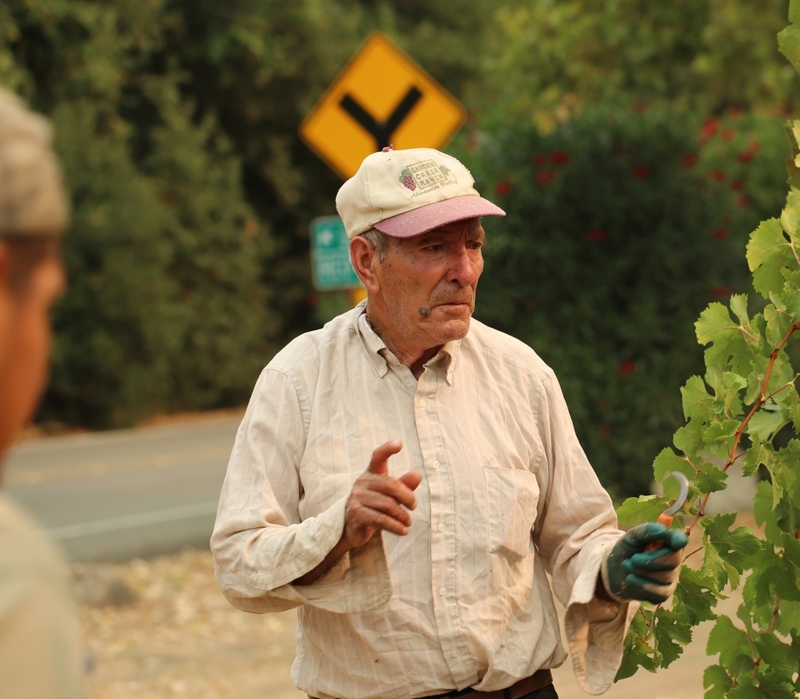 We speak of the Gonzalez Crew proudly to each of you who step on our property when you tour the ranch, walk the vineyards and taste our wines in the winery -- as none of what we accomplish and achieve are possible without any one of them. The articulate care in tending the vines; from spring pruning, shoot positioning, suckering removing the extra growth, managing canes gently placing them between the wires, pulling leaves for best sun exposure, green thinning before harvest for one or two last pushes for flavor maximization, and ultimately hand harvesting each and every cluster on this ranch. I have three brothers and two sisters who I adore each of them. They live in Europe and the states. I cannot be certain I have the patience to work like this side by side each day with them as an adult. I certainly did as a child and I truly loved each minute. We also did not have a choice back then. I admire our crew as when I hear them talking, laughing and at times arguing with each other in the middle of the vineyards. There is such passion! You hear and feel the camaraderie and love they have for each other. We know each of them quite well today. Manual Jose, who we have all nicknamed Junior as he is the son of Jose, Fidel's second son, has brought his beautiful family to Alexander Valley. Proudly, today we have four generations of one crew of the Gonzalez Family at Garden Creek. We are humbled. I can say, we see each other daily and a smile is shared.